SEOUL, Feb. 28 (Yonhap) -- South Korea's President Park Geun-hye was named a bribery suspect on Tuesday as special prosecutors wrapped up their three-month probe into a massive influence-peddling scandal. The probe team, led by Independent Counsel Park Young-soo, suspects that the president colluded with her longtime friend Choi Soon-sil and took bribes from the country's largest conglomerate Samsung Group in return for business favors, its spokesman Lee Kyu-chul said. 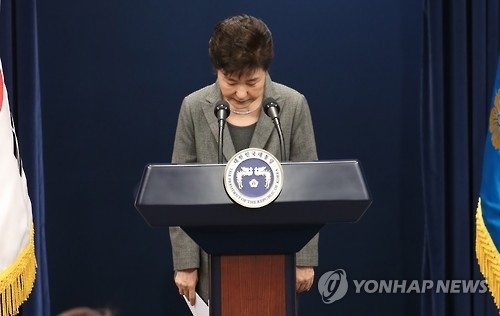 President Park, currently awaiting the Constitutional Court's decision on her impeachment, will not face charges for now as an incumbent president has immunity from criminal indictment. State prosecutors will decide whether to continue with the investigation into Park as the deadline for the special probe team expires Tuesday. Special prosecutors indicted Lee Jae-yong, the de facto leader of Samsung, on charges of giving or promising some 43.3 billion won (US$38.3 million) in bribes to the president's jailed friend Choi in return for the government's backing of a merger of two Samsung affiliates in 2015. Special prosecutors said the merger between Samsung C&T Corp. and Cheil Industries Inc. generated 854.9 billion won in profits for Lee Jae-yong and other major shareholders. However, the merger cost the National Pension Service (NPS), South Korea's state pension fund, at least 138.8 billion won, according to the special prosecutors. The NPS, the world's third-largest pension operator, has faced criticism for supporting the merger. The state pension fund owned 11.21 percent of then-Samsung C&T Corp. and 4.84 percent of Cheil Industries Inc. The business merger was seen as critical to the smooth management succession of the group from ailing Samsung Electronics Chairman Lee Kun-hee to his only son and Vice Chairman Jae-yong. Four other senior executives -- Vice Chairman Choi Gee-sung and President Chang Choong-ki from the group's future planning headquarters and President Park Sang-jin and senior executive Hwang Sung-soo from the electronics giant -- will stand trial without detention. Following the announcement, Samsung said Choi and Chang resigned from their posts. The group said it will abolish the future strategy department, a de facto group control tower, and its affiliates will run independently. Choi Soon-sil, the woman at the center of the scandal, was additionally charged with bribery on the same day. She has been standing trial over a series of other alleged irregularities committed with the president's former secretaries. The spokesman Lee said they will seek to have Choi forfeit her illegally earned assets. He declined to comment on whether the property of Park, who was named an accomplice in Choi's alleged wrongdoing, will also be subject to seizure. A former university president suspected of offering favors to Choi's daughter and a doctor believed to have provided unauthorized medical treatments to Park were also indicted. Kim Young-jae, the doctor close to Choi Soon-sil, gave Botox injections to Park five times between May 2014 and July 2016 without leaving official records. He did not go through due security and safety checks. Botox injections work by weakening or paralyzing certain muscles or by blocking certain nerves. The effects last for about three to four months, according to the U.S. National Library of Medicine. Lee Young-seon, a presidential aide, was indicted on charges of helping Park receive the treatments and opening mobile phone accounts under other people's names that were then used by presidential officials. Still, he has not been taken into custody as a Seoul court rejected an arrest warrant on Monday. A total of 17 suspects have been officially charged by the probe team on the final day of the investigation, according to the spokesman. Two of them include Choi and An Chong-bum, who are already standing trial based on an investigation from state prosecutors. There are 13 other suspects that have been charged since the launch of the special counsel team in December. The investigation team was given 70 days with another 20 days preparation to look into a broad range of alleged irregularities committed by President Park and her friend Choi. The special counsel will hold a press conference to further elaborate on the probe results on Monday.